A Three Piece Silver Tea Set, Birmingham 1930. A heavy quality polished solid silver three-piece tea set produced by William Neale & Son. This three piece set includes the teapot, two handled sugar bowl and milk jug. The tea service is of elongated octagonal form and has decoratively shaped handles. Total weight is 922 grams. The teapot measures 7 inches (18cm) in height with a length (from handle to spout) of 11 inches (28cm) & weighs 0.586kg. The sugar bowl measures 3.2 inches (8cm) in height with a length of 6.5 inches (16.5cm) & weighs 0.192kg. The milk jug measures height of 3.75 inches (9.5cm) with a length of 5.25 inches (13.25cm) length & weighs 0.144kg. The entire set together weighs 0.922 Kg. Each piece is in excellent condition and has been individually polished. Please further images below for further detail & condition.. 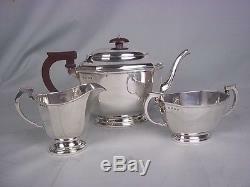 The item "A Three Piece Silver Tea Set, Birmingham 1930 By William Neale & Son" is in sale since Tuesday, December 27, 2011. This item is in the category "Antiques\Silver\Solid Silver\Teapots & Sets".